Click on the card to get a copy of the QSL Maker program..! 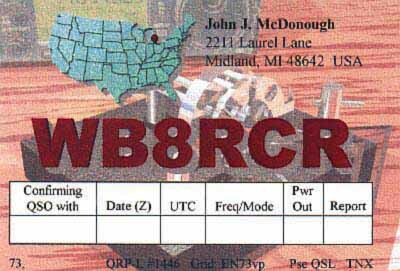 This is nice software, developed by John McDonough, WB8RCR. It lets you design and print your own QSL cards, allowing you to personalize the background, by importing pictures or just filling with a plain color, and it lets you personalize the heading and address as well as your own callsign. It can import ADIF log file for fields auto-filling during the print process, or allow you to insert directly QSO Data into a table. It runs on Windows; Tested in Windows 98SE, Windows XP(tm) and Windows 7(tm), and is completely Free !